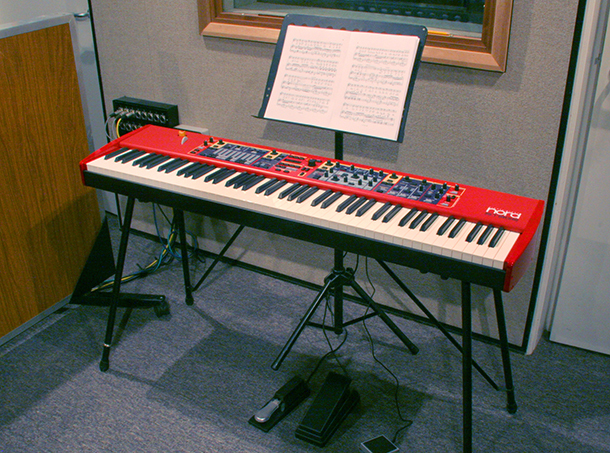 The Clavia Nord Stage keyboard has 88 keys, (Bottom A to Top C), the same range as a piano. There is a full set of pedals for Swell, Rotor on/off and sustain. 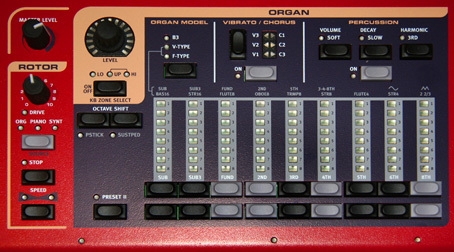 It features three “engines” for organ, piano and synth sounds which can be played together or separately in any combination. 1. Organ section with realistic emulations of a Hammond B3 with percussion, keyclick and drawbars, Vox Continental and Farfisa. As well as vibrato, there is also a rotor effect, similar to the original “Leslie” speaker system with on/off, slow/fast. 2. Piano section with Yamaha & Steinway Concert Grands, Electric Grand, various Uprights, three Fender Rhodes Electric pianos MkI Stage, MkII Stage and MkV stage, Wurlitzer 200A and Hohner Clavinet D6. 3. Synth section with many pre-set sounds leads, basses, strings, shimmering bells, etc). It uses subtractive, FM (frequency modulation), Wavetable and PCM (Pulse Code Modulation) synthesis. There are three banks of 99 memories with presets covering Synth, Pad and Bass. In other words, it’s highly versatile! 4. The keyboard, which is weighted, can be split so the left hand has one sound for comping, while the right hand plays the lead. 5. An Effects section, which can modify the sound with compression, reverb, delay, various amplifier emulations, distortion (useful with the Hammond Organ ), chorus, flange and three-band tone control.